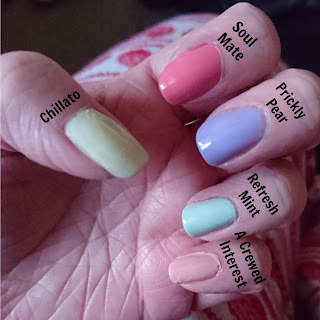 TheDarkeowl: Favourite Nail Polishes for Spring! Favourite Nail Polishes for Spring! So spring is almost here and I'm super excited! I'm so glad to get out of winter and (hopefully) get some more sun and warmth! One thing I love about spring is the colours and flowers. Here are my favourite nail polishes for spring time! First of my favourites is Essie's Chillato! I only bought this recently so I can't comment on the lasting power but the colour is absolutely amazing! It's an incredibly pale mint green/yellow and I think it's so fresh for Spring time! Next up is one of my long term favourites. It's Sinful Color's Soul Mate. It's a beautiful dusty pink colour and just looks so elegant on the nails. It applies easily and lasts a good while on the nails. Although I wear this polish all throughout the year I think it's perfect for Spring. On my middle finger I have Barry M's Prickly Pear gel polish. This is a lovely lilac colour and is bright enough to be noticed but is still pretty subtle, it's a nice cool colour and applies brilliantly! Refresh Mint is another new polish I bought ready for the spring season. It's a polish from China Glaze and I've seen that it's a dupe for Mint Candy Apple (everyone's FAVOURITE mint green!). It is a really pretty colour and is very bright, great for sunny days! The last colour is Essie's A Crewed Interest. This is a lovely peach toned colour that really works well. It becomes opaque in around 2/3 coats and does well to last on the nails. It's such a nice subtle colour and reminds me of flowers in Spring! So these were my top nail polishes for spring time. I love this time of year, the flowers are beautiful and the weather finally starts getting nicer! Do you like any of these polishes for spring? What are your favourites? Let me know! NOTW 24: National Beer Day Nails!